If I had known about spray paint as a teenager I could have gotten into so much more DIY trouble. I’m more than happy to make up with it now, though! And tis the season to spray paint! 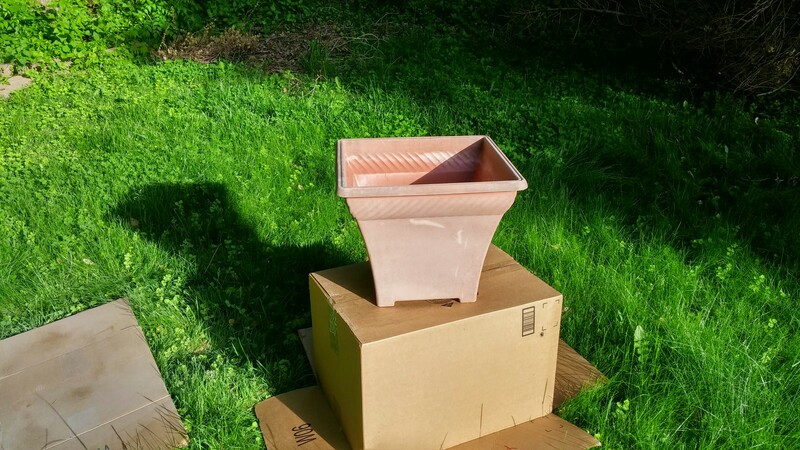 I don’t have my “spray paint studio” set up in the garage anymore, but I was able to make due with the use of cardboard protection on the lawn (because I really don’t need multi-colored grass). What was I spray painting? 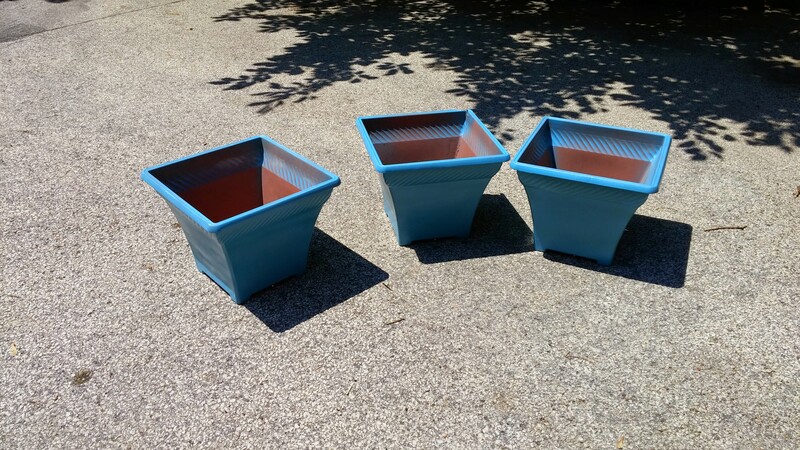 Well, this year we switched out my mom’s old, tired, plastic, terracotta colored planters for new, bright, and shiny ones. Most were in okay shape structurally (nothing a little hidden duct tape couldn’t fix) but they were ridiculously faded. Solution? I take them and see how well spray paint works on them! I had never spray painted plastic before, but I figured it can’t be that hard, right? I prepped the pots by scrubbing them with Mrs. Meyers Surface Scrub and letting them dry in the sun for almost an hour. Then began the fun part: prime and paint! 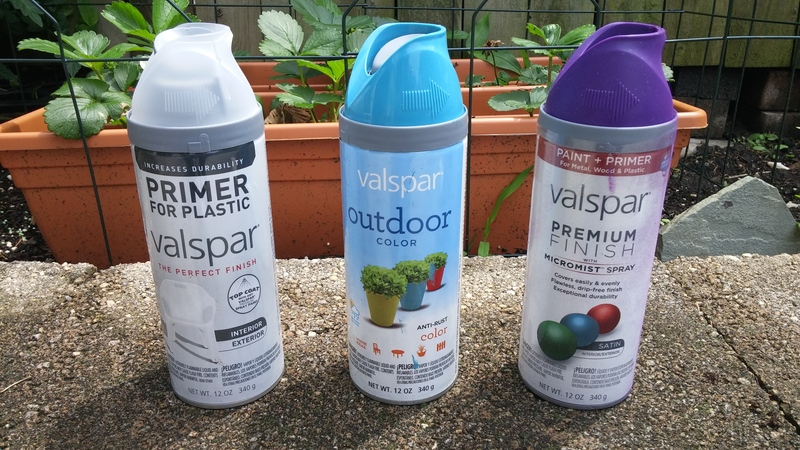 I’ve become a devotee of all things Valpsar from Lowe’s after using it to paint our dining room, upstairs hall, and guest room, so I figured I’d give their spray paint a try. It was, as a plus, much cheaper than other products I had used in the past. Although some of their colors say that they’re fine to use directly on plastic, I decided to prime all the boxes with two to three coats anyway. I had a few different places that the boxes were going, so I chose two different colors: Tropical Oasis and Sumptuous Purple. I could not be happier with the way the boxes turned out! I probably did three to four coats on each box. Both colors came out bright and cheerful. Two of the Tropical Oasis boxes sit in a very shady bed behind Hostas under our cherry tree, and one holds a plant on our driveway. The Sumptuous Purple boxes came out equally brilliant. Because they’re going along the side of our lawn and sitting directly in the garden beds which are filled with ivy and can get quite soggy, I wanted to make sure they had plenty of drainage, but also weren’t too heavy. Solution? Pine cones! 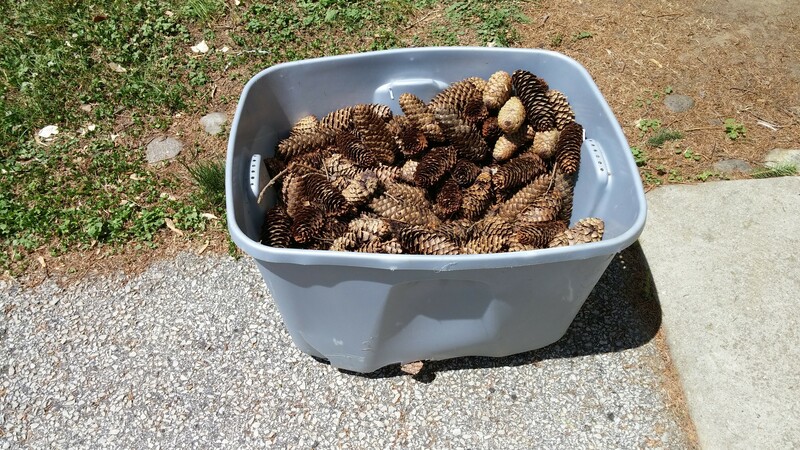 Doesn’t everyone have a tote full of pine cones just sitting in their garage? Well, this girl has TWO totes full. Over a year ago, I spent all fall picking up the myriads of pine cones that fall from our huge tree because we learned the hard way that if you leave them through the winter, they create horrible divots in the lawn. I can’t walk without tripping on a good day, so my personal mission became collecting them. I figured we’d use them in our fire pit, but they burn so quickly they’re not very helpful. Finally, though, they have a purpose! 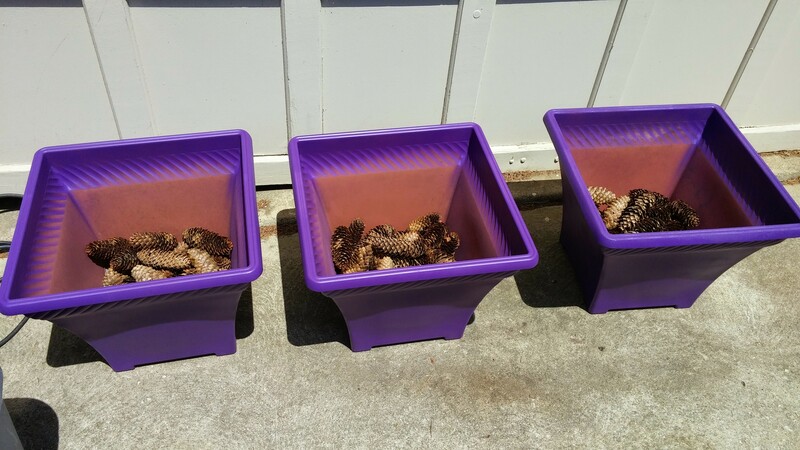 I filled the bottom third with the pine cones and then added soil on top. I only planted Impatients in the boxes so they don’t have terribly deep roots to worry about. So far, they’re thriving! Now I just had to figure out what to do with the leftover spray paint… but NO WORRIES! 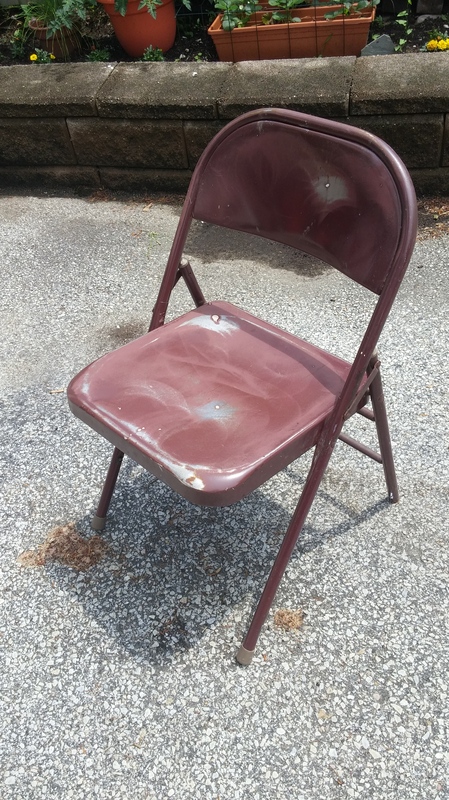 We inherited five of these sad looking folding chairs when we moved into the house. They were covered in rust. 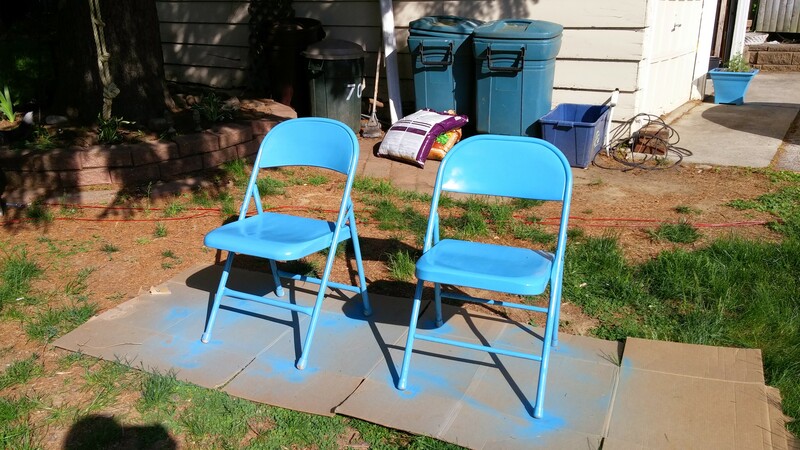 The first summer we lived in the house, I had spray painted a few tiny clay pots a beautiful lime green, and with paint leftover, I had sanded all five chairs and intended to paint them the same. Only two of the chairs got painted, though, but no worries! Now we have two more folding chairs to add to our collection for when we entertain! I love how cheerful these chairs are now and can’t wait until we have our first summer BBQ to pull them out. Today was certainly a dismal, rainy, gray day, but I’m so thrilled with all the things I’ve gotten done so far! Anyone need anything spray painted!? The rain is a killer, isn’t it? So dismal here right now with the weather! I can’t wait to share pics of my boxes 🙂 Thanks for reading! Yeah, BBQ! Tell me when and where and I will cook!